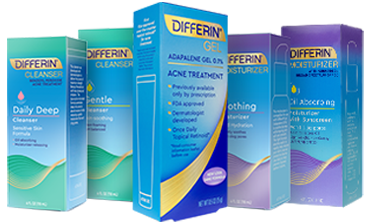 Differin® Gel has the first active ingredient in the over-the-counter acne category in over 30 years: adapalene 0.1%. This is a first. As the only advancement in over-the-counter acne treatment ingredients for over three decades, Differin Gel for clearing and preventing acne also represents a milestone for adult acne sufferers. It contains the first FDA-approved, prescription-strength, retinoid acne treatment available without a prescription. Those with acne want a different approach — we call it the Differin approach. Unlike a spot treatment that’s used only when needed, Differin Gel works when applied to the entire face once daily, to help prevent breakouts before they start. For the best experience, it should be used as part of a daily skincare routine of powerful-yet-gentle products, including a Gentle Cleanser, a Soothing Moisturizer and an Oil Absorbing Moisturizer. But that’s not all that makes Differin so...different. Differin Gel, which contains adapalene, is shown in studies to have superior tolerability compared to other prescription retinoid products not containing adapalene. Adapalene has a unique mechanism of action. Retinoids are believed to be beneficial because of their ability to affect the various proliferative and inflammatory mediators involved in acne. Retinoids act through retinoid acid receptors (RARs) to regulate the proliferation and differentiation of epidermal cells that are critical to acne pathogenesis. dermatologists to over 40 million people globally. 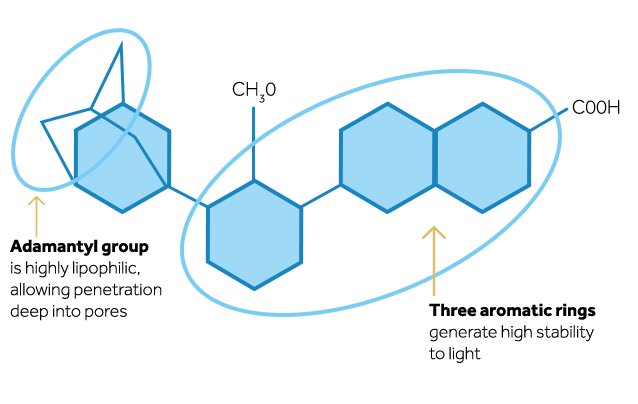 Adapalene, the topical retinoid contained in Differin Gel, has a unique chemical structure with treatment benefits for adults suffering from acne. How is adapalene different from other retinoids? Retinoids, such as adapalene...are ready to go once you put them on the skin. Differin Gel is a safe and effective treatment. It has superior tolerability compared to other retinoid acne formulations not containing adapalene. Common side effects include dryness, redness, irritation and burning/stinging. These symptoms usually peak at the 2- to 4-week mark before subsiding. Differin Gel should not be used in conjunction with products containing alpha hydroxy, salicylic or glycol acids, which may worsen irritation. Irritation may occur if using more than one topical acne product at a time. Multi-sponsor Surveys, Inc. 2016 Gallup Study of the Market for Acne Products Among Young Adults. http://www.multisponsor.com/wp-content/uploads/2016/08/Acne-Products-Among-Young-Adults-16004.pdf. Accessed 12/15/17. Czernielewski J, Michel S, Bouclier M, Baker M, Hensby C. Adapalene biochemistry and the evolution of a new topical retinoid for treatment of acne. J Eur Acad Dermatol Venereol. 2001;15(suppl 3):5-12. Weiss JS, Shavin JS. Adapalene for the treatment of acne vulgaris. J Am Acad Dermatol. 1998;39(2, pt 3):S50-S54.